Cherimoya Custard and an Award! Lemon Raisin Chocolate Cake and an award! I have been waiting over a month to see some snowfall for all the hype P had given. Am I crazy to wish for it???? Nah,all I wanted is to make a Snowman. Living in the Midwest that is certainly not a big ask.Though the weather has been cold,we haven’t witnessed much snow this year. The nature’s way of creating it white, reflects so well in the night. I wish to have a snowball fight, taste the icicle, skiing and enjoy the wondrous splendor of the nature, there’s always a next winter for these activities. Remember the fairy tales – Little Match girl, trying to sell matchsticks on a wintry New Year’s eve? I have fond memories of my school Annual Day celebration where I won this book as first prize in the Drawing competition while in Class I .My first tryst with snow was through this book.Little did I know that this would turn to reality many years later! In this weather, what could be more delicious than a hot Tandoori Gobi? Green Chillies – 1tsp (Crushed/minced) This is optional. 1.If you don’t have thick curd, hang curd in a muslin cloth for about half an hour to drain water. 2.Mix the curd along with all the powders (Chilli,Turmeric,Besan,Garam Masala, coriander powder & chaat Masala)in a bowl.If using ginger garlic paste & green chillies,add them too.Add salt & hing.The addition of Turmeric & Chilli powder gives it a nice Orange Color. 3.Cauliflower needs to be steamed so that it turns out to be l’il soft while eating.Either use the microwave or use our conventional method,parboil it with salt water.Ensure not to overcook. 4.Drop the Cauliflower to the mixture and mix well.Use a plastic wrap/a lid and close the bowl and allow it to marinate for about 4-5hrs in the refrigerator. 5.These are made in the Tandoor/Griller. If using a griller,push the florets onto bamboo skewers,keep some marinate mixture aside & brush the florets once in a while and grill them.I used the broil option in the Oven.Place the florets on a baking tray, sprinkle Olive oil and broil at 350F until color changes.In between flip the florets.Be watchful as it might get charred soon,as the heat is directly applied to the food in this method.However,the charred ones taste a lot better. Oil can be avoided as broiling doesn’t need oil.Broiler is a process of cooking food in high heat, so be very careful. In fact while making this, the smoke alarm got triggered at home:-P.It ain’t that bad,its just that I wasn’t paying attention to it. You may also place a silver foil on the baking tray, as the cauliflower has a tendency to stick to the tray. This is off to JFI,Cauliflower is the theme for JFI:Cauliflower,hosted by Mythreyee of Paajaka Recipes.The event was originally started by Indira of Mahanadi. Since this is orange in color,this goes to FIC Orange hosted by Aparna of Diverse Kitchen,originally started my Harini of Tongueticklers. Also,Rachna of the Gourmet Launchpad is hosting A Healthy Bite event,this is off to her event too.Rachna this appetizer is neither fried nor has any fatty food,am not sure if this qualifies,you may take a call.Thanks! Snow baby(man) looks cute..Ohh you pray for snow fall..And in Chicago i am praying for it to end.. This year we had more than 3 snow storms. Ohhh i forgot about the dish :) Tandoori gobi looks perfect for this winter..
That was a very cute snow man.. 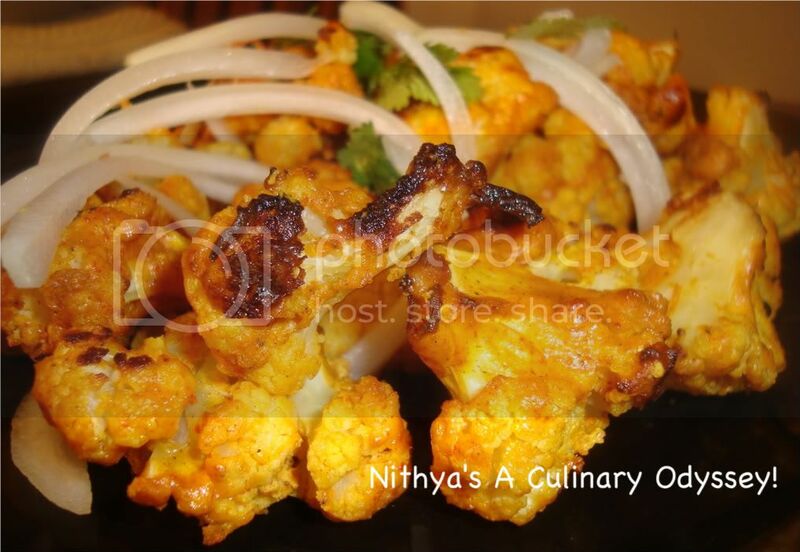 I made curds so as to make tandoori gobi for dinner tonight and was amazed seeing your blog.. I love this. I follow a similar recipe too. Mine is still in drafts. Your pics are cool, looks nice and yummy. I love cauliflower, I've never had it tandoori style before. Can't wait to try this! Very cool recipe and useful tips as well. I was wondering what to do in case we did not have a grill and you have answerd that very well. I will do the broil option and try this out. Thanks Nithya. I ve experienced enough snow in life. Now it is a big NO NO. That is always fun the first year, when u drive or have to go out in snow it is a pain... Oh my I want to grab the plate after a snow showeling! Very delicous! Gobi Florats looks perfectly golden brown !Beautiful pics.. broiling is the better way to cook them. Nice recipe too..
Wow super duper. Yum and spicy. Lovely snowman. Wow wat a delicious tandoori gobi, prefect for snowy days na!! !snow man looks too cute!! 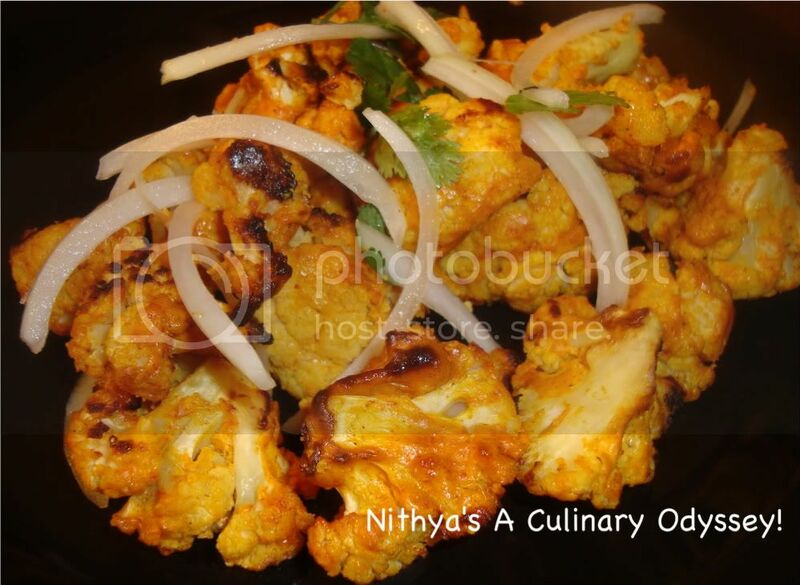 Tandoori gobi looks great..Nice recipe,Nithya..Have fun!! LOL... snowman is adorable but what i like better is ur tandoori gobhi. Wow! Snow man looks sooo cute amazing dear.Tandoori Gopi Looks absolutely tempting and very delicious& Perfect. LOVED the picture of tandoori gobi. I've never had it tandoori style before. try this out. Thanks for sharing Nithya. Thats a cute snow man! Looks so nice... Hope u enjoyed! Tandoori gobi looks awesome.. Will try this! tandoor n me are best friends in winter...m talking about indoor tandoor..lol. Tandoori Gobi looks so good and yummy! Snowman is too cute. nice recipe... have tried only paneer tandoori and not this one.. good way to eat cauliflower. looks yum. never tried this.. looks mouthwatering!! nice way to eat cauliflower. Asha – Thanks,Did you make one too? Varsha – 2 -3 snowmen wow that’s sounds exciting. Superchef,Mangala,Preety, – Thanks so much for your comments. Ujwal – U and me seem to have a lot of coincidences. Maya – I will wait for your post. Sara –I think you should try this,its yummy! Madhu,Lavanya,Lubna,Priya,Daily meals,Sia,Jaishree,AnuSriram,Navita,Rachel,Ashwini,Kamala,Paru,Uma,Mahimaa & Sowmya – Thanks for the wonderful comments. Its getting a bit warm here but I'm up for this cauliflower preparation in any weather. Thanks for participating in FIC Orange. Truly mouth watering! delicious recipe! Snowman looks cute...Lovely Tandoori Gobi ...perfect for this winter. 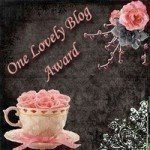 Hi Nithya,I have something for u in my blog. Pls accept! It snowed here as well today...the snow baby looks really cute:-) Tandoori gobi looks and sounds lovely ! heyy...ive something for you at my blog..come and grab it, girl!! Tandoori gobi sounds so good. Nice recipe. Nice picture... YUM! Nithya, how lucky for you that the dream came true:) I have seen a lot of snow during my treks but never made a snowman:), or seen it snowing! A tandoori gobi is just the right thing to have! Mouthwatering too! Thanks for making this for me....i thoroughly enjoyed it!! Looks delicious. Love cauliflower. My smoke alarm goes off all the time, for silly little things like toast. : ) Won't stop me from trying this recipe, though. I always hated Gobi.. but after I tried this recipe I changed my mind. Bored of the regular Aloo Gobi that I always made I decided to try something different and thats when I stumbled onto this recipe. My dishes never end up looking like the pics people post but for once it came out looking just as delicious as the picture. Tandoori gobi looks super delicious.